A View from Acqualoreto: If the NFL Fails, What's Left? If the NFL Fails, What's Left? The USA has been in serious decline at least since the turn of the century, by some measures from two or three decades earlier. Much of what there was, the majority middle class, the Constitution, an improving environment, a rising standard of living, is gone. From being the model for postwar development throughout the world, the US has turned into the world’s number one rogue nation, often feared, sometimes hated, and increasingly pitied. US industry has largely withered away, leaving a nation of service industries, from fast food and chic food through financial services and entertainment. Within the expanding entertainment sector there are professional and semi-professional (i.e. college) sports. America’s sports tradition has revolved around three seasonal sports, baseball in the spring and summer, football in the autumn, and basketball in the winter. Most high schools in the US field teams in all three sports, along with less popular sports such as track & field, soccer, and in affluent communities, even ice hockey, tennis and golf. Football and basketball are the ones that attract a paying audience in both high school and college. The seasons barely overlap so high school athletes can, and often do, play all three major sports on their school teams. With the growth of professional sports and their ever present drive to maximize revenues through television, the seasons of all three sports have expanded to cover at least half the year. Pro sports keep taking in ever more money, largely through TV, and pro athletes have a faster path to great riches than all but the shrewdest and sleaziest of upstart banksters, but they have to work hard to get there, as well as being possessed of exceedingly rare physical traits. Baseball, called the national pastime since the Great Depression, when out of work men could pass the long afternoons at the ballpark for less than the price of a movie, is now played mostly at night in front of well paid workers by outrageously overpaid players often recruited from countries where the game is still widely played, such as the Dominican Republic, the rest of Latin America, and even Japan. Just as gladiators working the Colosseum during the Roman Empire were mostly recruited from the distant outposts of the Empire, big league baseball players increasingly come from the further reaches of the American Empire. Basketball is played from early childhood even to middle age by many people throughout the US but a minuscule percentage are good enough to even think about playing pro ball. There are only about fifteen players on each pro team so the competition for a position on any of those teams is statistically akin to being elected president, except that to be an NBA player you have to be really talented. It also helps to be a tough, agile, two meter tall kid who grew up spending most of his days shooting baskets in a focused, competitive atmosphere. White kids aren’t discriminated against as far as I know, but there just aren’t that many of them with those requisites so by now, basketball is an almost exclusively black sport, much as ice hockey and Nascar racing are white sports. Despite claims made by others, football is still the most popular American sport. It started in colleges such as Harvard, Rutgers and Princeton over a century ago and college teams still have huge and loyal followings, often playing in larger stadiums than those used by the pros. The big college programs have become more and more professional except that the players don’t get paid. Successful coaches at the big state universities are often the highest paid employees of their state. Vast numbers of players go through those schools tuition free but only a tiny number hit the jackpot and make it to the NFL. 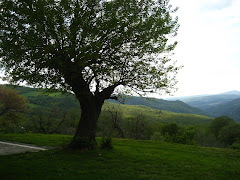 Once upon a time, preppy college boys were squeezed out of big time football by the sons of Polish steel workers and coal miners from western Pennsylvania.. Industries and demographics have changed. In 1961 James Meredith was the first black student admitted to the University of Mississippi, accompanied by federal marshals ordered in by President Kennedy to protect him from the redneck mobs trying to keep him out. By 1985, Bo Jackson, one of the greatest athletes in American history, was winning the Heisman Trophy (for outstanding college football player of the year) at Auburn, a nearby rival of Ole Miss, in front of huge cheering crowds of the same sort of people who a generation earlier would stop at nothing to keep their universities white. Sports have their dark sides but football (and basketball) have had a role in the racial integration of the South. There is a delightful irony in seeing vast crowds of white people across Dixie, from the Carolinas to Texas, cheering on the black heroes of their alma maters on Saturdays in autumn. Those players now go on to make up the lion’s share of NFL rosters. Players’ salaries in all pro sports continue to rise but there are warning signs on the horizon for football. The most discussed problem is the growing evidence of brain damage among retired players. Measures are being taken to reduce hits to the head but football is, by its nature, a spectacularly rough game. If the violence is reduced, will the spectacle maintain its popularity? A second and less discussed cloud on the horizon is the cultural divide between team owners and players. While the majority of players are non-white and from humble circumstances, the owners of the thirty-two teams are all billionaires, tending to the far right politically. 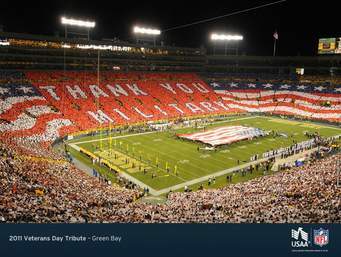 It is often hard to determine if NFL games are simply lavish popular entertainments or recruiting rallies for the Orwellian-named Department of Defense, which does in fact pay the NFL to promote recruitment. Most games feature military flyovers, military bands, giant American flags and large units of uniformed veterans of recent military campaigns honored in the stands, or sometimes on the field, as our heroes who have sacrificed to defend our freedoms. The solemnity of the religious/militaristic rite is marred less by the protests of a few civic-minded players than by the grotesque mauling of the national anthem by pop stars trying to be original. Perhaps it’s only fair that the anthem is routinely trashed since its third stanza, rarely sung in public, is an ode to the coming defeat of the British and their efforts to free American slaves in the War of 1812. Statues of Confederate heroes have been disappearing from public view recently due to public outcry but the Star Spangled Banner is more of an affront to the descendants of those slaves than any of those post-Reconstruction statues. NFL players are in a very complex position. Coming from underprivileged backgrounds in stark contrast to those of the owners, they are subjected to hyper-competition for their jobs. Surviving that competition can make them extremely wealthy young men but they are also in on-going, cut-throat negotiations with their employers, who can dump them at will. Such tensions came to light with Colin Kaepernick, an incredibly gifted athlete and far better than average quarterback. 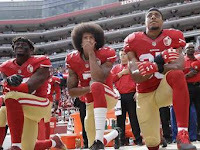 During the 2016 season, he refused to stand for the playing of the National Anthem prior to games to protest the all too frequent fatal police shootings of young black men and women in cities throughout the USA. An increasing number of players joined his protest. Despite a severe shortage of good quarterbacks, the key position in football, Kaepernick has been without a job for more than a year and is now suing the owners, alleging a conspiracy to keep him off the field., a charge which is as difficult to prove as it is obvious to see. He should be playing but, as a starting quarterback for a few years, he has already made more money than most Americans will earn in their lifetimes. Other younger players face bigger risks to their earnings. Many will no doubt keep their heads down and their comments to themselves. They walk a fine line between a return to poverty or a path to unimagined wealth. Still, it’s not hard to foresee this incendiary environment blowing up at some point. Recently the NFL announced new rules for the 2018 season. Players will be required to respectfully stand during the playing of the national anthem, with an option of remaining in the dressing room until it’s over. Liberal media and journalists have come down hard on the NFL for suppressing the First Amendment rights to freedom of speech of the players, proving nothing so much as how the concern of today’s American “left” for constitutional rights is directly proportional to the wealth of the citizens whose rights are at issue. Do any of you who work in contact with the public, at a bank or a Walmart or an advertising agency, think that you could show up at work wearing a badge of support for a cause not supported by your employer? Journalists should know better, since few of them can write what they want when it contradicts the views of their employers. The USA is a big, influential country with a long list of achievements in politics, science, art and culture. While our political heritage has fallen from the gutter into the sewer, a few of our better inventions have survived. Highest on my list of remaining American things of value are jazz and football. Jazz is America’s music. Fortunately, it has spread to the rest of the world and is often appreciated more elsewhere than it is at home. It may be America’s greatest gift to the world and by now, excellent jazz musicians are emerging from the most unlikely and remote places on all continents. American football may have evolved from English origins, along with soccer and rugby, but it is a distinctly American game. Unlike jazz, it has not effectively spread to the rest of the world, despite the efforts of the NFL to promote it with a few games in London and Mexico City. Overprotective parents increasingly discourage or forbid their children from playing it but nevertheless, football is one of the world’s great sports, both challenging to play and exciting to watch. Many sports feature remarkable athletic performances but football brings the fascination of a chess match played on a 100 yard long board with giant moving chess pieces of diverse capabilities. More than most, it is a coach’s game, but unlike baseball, that other coach’s game, where strategy often squeezes out most of the action, football never lacks for action, except during the TV commercials, which provide welcome breaks for getting another beer or disposing of the last one. Hope is in short supply in America right now. The progression from James Meredith to Bo Jackson lets me hope that the country, despite appearances, is not beyond redemption. So, for this celebration of the nation’s independence on the two hundred and forty-second anniversary of the Declaration of Independence, I propose a toast to Colin Kaepernick. May more of his colleagues find their voices. Despite all its problems, football must succeed! We have no queen to pledge our fealty to and no World Cup presence to cheer for. With democracy banished over the past several electoral cycles and American industry moribund, what else is left for Americans to rally round? While professional football is popular, College football is viewed with considerable enthusiasm both at home and in the bars, almost akin to European soccer. Fans fill 100,000 seat stadiums and the games can be as or even more exciting as budding talent play hard and in some cases, seek to make the pros. As for taking a knee, we learned something from that, mostly that the issues are real, but seen from two deeply different perspectives where both had a point to make. We live in a nation with more guns than people, not sure exactly why that is, but it is our reality and I am more surprised by how few people we manage to shoot in a given year. Maybe football helps distract our males and gives them something else to fight about. There is something “no nonsense “ about it, where reality delivers a real outcome every couple of minutes and it is a welcome relief from debate.